Controversial topics headline The Grind. Caleb Moore, Ray Lewis, and Chris Culliver. For some odd reason I decided to watch Caleb Moore’s snowmobile crash on YouTube. It’s a pretty sick feeling knowing the dude died. 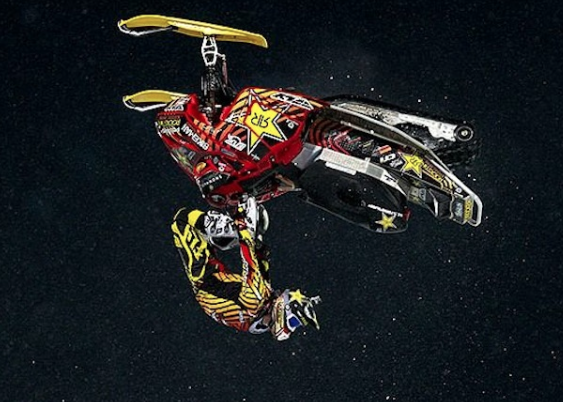 Moore was attempting a backflip but came up short, and the skis on his 450-pound snowmobile caught the lip of the landing area, sending him flying over the handlebars. Moore landed face first into the snow with his snowmobile rolling over him. Though he got up and walked away, it was later revealed that he suffered a concussion and experienced complications with bleeding in his brain and around his heart. In all seriousness, it’s amazing the X-Games don’t endure more scrutiny. The X-Games are thrilling, cool, sick (for the lingo), but also extremely dangerous. Granted, Moore had probably practiced this trick hundreds of times, but the end result is frankly not surprising. The NFL has countless lawsuits for guys tackling one another…the X-Games is like signing up for Russian roulette. I’m crazy, but not ‘get on a 450-pound snowmobile and attempt flips 20 feet in the air crazy’. Speaking of which, San Francisco 49ers cornerback Chris Culliver told Artie Lange how he really felt about gay players in the NFL. Look, Culliver is entitled to his opinion — but he might want to THINK about the repercussions of a statement like such. If he wants to say that in the confines with his friends, so be it. ON THE BIGGEST STAGE TO A BUNCH OF RAT REPORTERS BEFORE THE BIGGEST GAME OF YOUR LIFE?? As my neighbor The Colonel would say, you MO-RON! Ray Lewis should just shut up. He’s perhaps the best linebacker of our era, a great leader, and a loveable psychopath. But that doesn’t mean we need to hear him avert every question about anything to God. “This is God’s time” is all Lewis could muster up when asked how it felt to beat Denver three weeks ago. Really? Winning a game is now God’s time? A writer for Barstool Sports summed it up pretty well (discretion advised). Rejoice! The St. Louis Blues have a game tonight. That’s right…whoever schedules NHL games thought playing six games in nine nights with two back-to-backs was just as smart as a three-day break. Holy Jumpin! The Blues need to run over Columbus tonight. Though the score might not indicate such, a physical beat down is more likely. Expect the Blue Jackets to come out with some fire after their head coach Todd Richards ripped them apart following a loss to Minnesota. Because Columbus is pretty thin offensively, their game plan consists of dumping the puck deep and maintaining possession in the offensive zone … sound familiar? If the Blues can pin the Jackets in their own zone and take the crowd out of it early, it should result in another 2 points for The Note. They won four of six meetings last season. Jaden Schwartz and Wade Redden will sit. Vladimir Sobotka will play with Patrik Berglund and Chris Stewart and Scott Nichol will center the fourth line. Ian Cole subs for Redden, who is out with the flu. Brian Elliott starts in goal. Finally, what are the Memphis Grizzlies thinking trading Rudy Gay? Here are some tweets that might help.